Finger Painting! 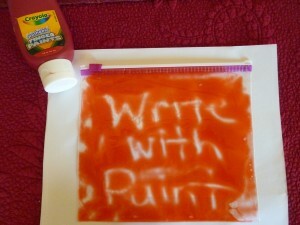 A wonderful, soothing activity to express creativity with cold, wet paint on a blank canvas of white paper – for some that is. For others, it is definitely a non-preferred, “avoid if possible” activity. Why is this? Some people, especially those with sensory sensitivities, do not like getting things on their skin. There is something about the feeling of something that doesn’t belong there that they cannot stand. When I imagine a child like that finger painting, I see them literally paying no to attention to what they are doing and spending the entire time trying to find a way to keep from touching the paint and if they do, how to get it off of their fingers and hands. How can I imagine this? Because Andrew is one of those children. He does not like having things on his skin and if something gets on it, he needs to have it wiped off right away. If he had to do an activity like this, he would be done in 2 seconds after making a few swipes with his fingers and then yelling about needing help getting the paint off. I was cleaning out my art supply box one day and found some containers of finger paint. 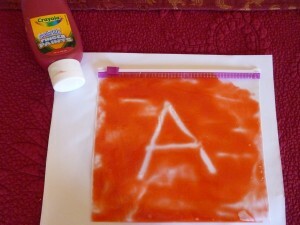 Poor finger paint, never getting a chance to be used! I almost threw them out and then I thought about what it was that made it so unappealing to him. What would happen if I took away the “ick” factor? Would that encourage him to experiment with it? Since I am always trying new things to see if they work for him, I have found that it never hurts to try! 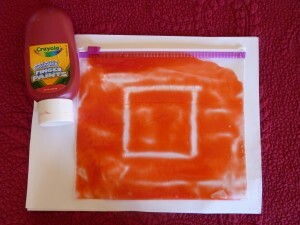 So, I did a little experiment of my own and squeezed some finger paint into a sealable plastic bag. I closed it tight and began playing around. Turns out that it works great! Plus there is no mess to clean up or worries about getting it onto one’s skin. I tried it as a My Obstacle Course station activity and he loved it! He got to experience something other children do in a way that made it not only tolerable but also enjoyable for him. It also gave us another fun, easy way to practice his fine motor skills. It is great because once he is done with one shape, letter or whatever he draws, he can “erase” it by smoothing the paint to create something else. It also lasts for a long time when left sealed. Now, I do realize that he will need to build up a bit of a tolerance for things getting onto his skin but if the purpose of playing with finger paint is to have another way to practice drawing or writing skills than this works great. Plus, this is still a sensory activity for him because he gets to feel the squishiness of the paint (which feels “gel”-like) without the anxiety of it getting on him.